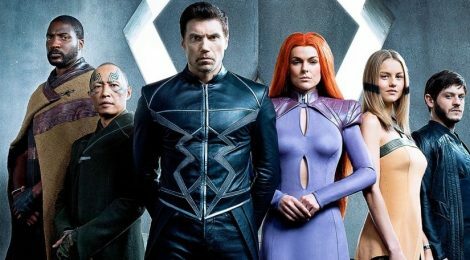 Pilot Season - The Inhumans - Honk if you love justice! I’ve watched the two episodes of Marvel’s new show, The Inhumans, and I’m reminded very strongly of season one of Agents of SHIELD. With a little of the lackluster parts of Iron Fist thrown in for good measure. It’s not great, but there is the tiniest of hope in me still that it can get there. Inhumans, in case you aren’t a comics fan or caught up on Agents of SHIELD, are humans who are descended from ancestors who were experimented on by the Kree long ago. When exposed to a material called Terrigen, they mutat–*Fox kicks in the door*–er, transform in some way. Some gain cool powers, some might just get a minor change, like a tail or cat ears. The Inhuman royal family lives on the moon in the city of Attilan, where a rigid caste system somehow keeps the population limited…? It’s honestly a bit unclear. You have Black Bolt, the silent King, who has a voice that can shatter mountains, and Queen Medusa, whose can control her long super-strong hair. Medusa’s sister, Crystal, can control the four classical elements (earth, fire, water, air). Gorgon has hooves. Karnak sees the flaw in all things – he’s one of my favorite Inhumans. Triton is the acquatic member of the family. Maximus is Black Bolt’s brother, and seems so far to have no powers from his Terrigenesis (though if they follow the comics that may not be the case). He thinks the Inhumans belong on Earth. They do the best they can with the costumes. Like most shows, they don’t like covering the heads of anyone expected to emote, and that’s going to be double for Black Bolt, who can’t speak without destroying people. I’m curious about where they are going with this, which is enough to get me watching the next episode. I like Ken Leung as Karnak, and Iwan Rheon is good as Maximus. The CGI is lacking for sure. They seem to have improved Medusa’s hair somewhat, but then they work around that anyway. Lockjaw is cute but never seems to inhabit the scene, and he’s sidelined too. A lot of the rest of the acting is subpar, though the dialogue given to them doesn’t help. My hope is that it improves as you get past the pilot but it’s a Scott Buck show. There was a lot of exposition to get through, but it’s done as just static infodumps. Even those would be okay, but the dialogue is clunky. I was able to make it through the early bits of Agents of SHIELD because I liked some of the characters, and was curious about the mystery of Coulson’s return. There’s less of an “in” here because you haven’t met any of these people before. It’s a short season so I’m probably in for the rest (especially with a Kevin Tanchareon-directed episode coming up) but I wouldn’t blame anybody who bailed.